I recently watched a TED Talk that struck a major chord with me. I guess it mostly confirmed something most of us already know — but helped me name something I really need to work on with one of my children. Angela Lee Duckworth spent years studying what determines success. She and her team tried to predict who’d succeed and who’d fail in really tough situations — West Point Academy, the National Spelling Bee, rookie teachers in really tough environments, salespeople at big companies. She found that that IQ, social intelligence, good looks and many other important contributing factors are NOT the most important factors that determine success. What determined who’d succeed was GRIT. According to Duckworth, grit is passion and perseverance for a long period of time. Grit is keeping your eye on the big goals and working towards them steadily even when the immediate stuff is really hard and really not fun. Grit is living life like a marathon, not like a sprint. We know so little about how to build grit in people. Talent doesn’t make you gritty. Grit is unrelated or inversely related to talent. Ms. Duckworth said there’s no real answers yet about to how to build grit in people. She said we need to be gritty about figuring out how to build grit. Watch the whole talk here if you want (it’s just 5 minutes – and really leaves you hanging!). When I look at my own children and the people I know well, I see quite clearly that those who find success in their endeavors are generally gritty. So I want to do all I can do to help my kids develop the grit they need. Some of them have come by some serious grit quite naturally. For others, developing grit will be a bit of an uphill battle. But I believe it’s possible. And I believe it’s quite necessary. I know that when I help my kids set goals that are a bit of a stretch — but not too much of a stretch — and help them make and execute do-able plans to get to their goals, then celebrate their achievements like crazy when they reach those goals, I’m helping them build grit. As they are urged to achieve hard things — whether it’s reaching a summit on a tough family hike, mastering a new piece on the violin or guitar, or helping with a long sweaty project in the backyard — they see that they can stretch, they can accomplish, they can reach. And I think seeing that hard stuff is possible is an essential element of grit. One of my less-gritty kids got a terrible grade in PE last year because he didn’t really try very hard at all. He kept forgetting to bring his PE uniform. He didn’t push himself when they did the required Presidential Fitness Tests. He said his foot hurt or his back hurt or his shoes were too tight or whatever the malady of the day was. And when we saw that ridiculous PE grade (which was based purely on just bringing your PE stuff and showing real effort), we weren’t pleased. We decided that in order for this child to have the tablet he’d saved up to buy, he needed to rectify that grade. We had him look up the Presidential Fitness Test online and find out how many push-ups, pull-ups, and sit-ups a kid his age was supposed to be able to do plus how fast he was supposed to be able to run a mile. And he agreed to work to meet those benchmarks and pass the fitness test this summer to make up for his bad grade and earn the right to get the tablet he earnestly wanted. We helped him make a chart and a plan including a few minutes a day several days a week of working on physical stuff. And we assured him he’d have the tablet within a couple weeks if he followed the plan. He’s a strong, healthy kid and the benchmarks seemed very reasonable for him. Well, despite lots of gentle reminders and suggestions, he just didn’t follow the plan. He sporadically worked on a few sit-ups or push-ups here or there and with some slight arm-twisting, he consented to running a mile on a few occasions. Finally, as the end of the summer loomed near, we decided to place a time limit on his goal and helped him draw up a more specific timeline and schedule for getting his goals accomplished. And with the more specific plan and timeline (along with just a tad bit of threatening – we did tell him he wouldn’t be able to get the tablet at all if he didn’t get complete the requirements by a particular date), things started to click for him. He passed off the sit-ups, push-ups and pull-ups fairly quickly by getting into the right mindset and pushing past the “I hate this” feeling just a little. But the running goal was the hardest one — not something he could just push himself to do by trying extra hard for a few minutes (like he was able to do with the sit-ups and push-ups and pull-ups). He needed to run every day for a while to increase his speed and get to the required 8 minute 25 second mile. He really doesn’t like running. We accepted that then assured him that he COULD do it and helped him see that taking 10 minutes or so to go running each morning for a while really wasn’t the worst thing ever. And once he got consistent with running a mile every morning, he was able to meet the goal on his 6th time in a row. We were all SO happy for him! And he’s SO excited to have that tablet in his hands – there’s nothing like getting something you’ve really worked hard to get. I don’t think this goal turned this child into a runner. Or into a really self-motivated guy. But I do think it helped him to see some grit in himself and helped him be willing to try a little harder in the future. And he needed to see that in order to build more grit. Grit builds on grit. And the extra-happy ending to this story is that this child is going to have grit-building experiences all year thanks to his membership on the school volleyball team. At the beginning of the school year, we told him he had to try out for a sports team, any team, and that all we asked was that he go to the first tryout and make a real attempt. If he didn’t like it or didn’t make the team, all he’d have lost is an hour or two of his life. He wasn’t happy about this requirement but I like to think that his recent success with the running played into his ultimate agreement to go to tryouts and do his best. And what do you know? He actually seems to have some talent for volleyball and the positive peer pressure and coaching from someone other than his parents is proving to be wonderful for him. So here’s to more grit-building experiences that can build on each other. I hope we’re on a roll. But I know there will be plenty more bumps in the road. I know I’m going to have to be gritty about building grit in my kids. QUESTION: How are you working to build grit in your kids? What successes and struggles do you have in this area of parenting? 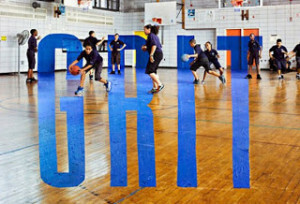 CHALLENGE: Decide on one thing you can do to help a child (or all your children) develop more grit. If you have older children, talk to them about grit and why it’s important and help them choose something they’re going to do to build grit in themselves. I had this discussion with my son as part of the whole “you must try out for a sports team” discussion — and it really seemed to help!